What region is right now the most interesting region to invest in, with regards to the future, new developments, expanding tourism, best reachable, golf development, medical services, availability of water, etc.? Can one, as a foreign individual, purchase private property? This depends on the treaty between your country and Croatia . If this treaty (reciprocity) is in place for your country, you or your company can possess land and buildings in Croatia , as long as these are not farm land, forestry or national monuments. Reciprocity is in place for, for example: Argentina , Austria , Belgium , Denmark , Finland , France , Ireland , Iceland , Canada (only Ontaria, BC), Luxemburg , Netherlands , Norway (some limitations), Germany , Poland , USA , Serbia , Spain , Sweden , Italy , UK and Northern Ireland . Australia has a special agreement. If there is no reciprocity you can buy real estate (also farm-land) by establishing a local company. Can one, as a foreigner, purchase property through a local company? Yes, you establish a D.O.O. (a Ltd.). The d.o.o. purchases the land or the building. Can the owner of the d.o.o. be 100% shareholder? Yes, the foreign owner can be 100% shareholder and only director. It is not necessary to pay a salary to the director. Can a foreign company purchase land or property in Croatia ? See other question: this is subject to reciprocity. Does the foreign company need a local branch office then? With a local board member, lawyer or trustee? No this is not necessary. If one would want to execute business in Croatia it is strongly advised to establish a (doughter-) d.o.o. Business from that local entity is practical and much quicker. Establishing a d.o.o. costs 1.750 euro turn key. What are the costs of establishing a d.o.o.? These costs vary all over the country. A new administration was established, called HITRO (Croatian for 'Fast') to smoothen the process of establishing a company. Experiences are that this administration actually delays the process. Middelland is assisting its clients for years now with this. costs of establishing is 1.750 euro turn key (all submissions of documents/ announcements /opening of Euro account and Kuna account / report to Croatian National Bank. This takes you only 1 afternoon, the rest is arranged for you. Is there a treaty against double taxation between Croatia and my country? 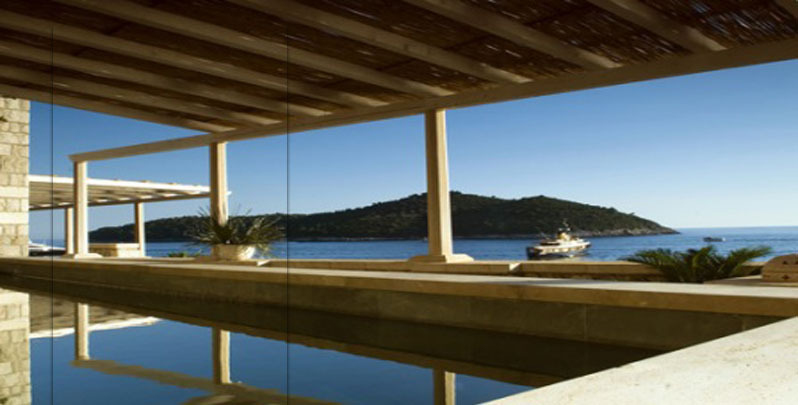 What are the extra costs on purchasing real estate in Croatia ? Real Estate Transfer Tax: 5%, Legal costs: ca.1,2% depending on your conditions to the purchase, agent commission: 4%. Other costs are: establishing of d.o.o. (if necessary): 1750 euro or, if you are buying as a natural person: 1.000 per person for listing as foreigner into the cadastre. Who pays these costs? Buyer or seller? The buyer pays these costs. What are the average agent commissions in Croaita. What banks offer mortgages to foreigners in Croatia ? Many EU banks are preparing to start with this product, but are awaiting EU admission of Croatia . Some Austrian bank offer mortgages to foreigners ( Austria has always been the financial 'big brother' of Croatia ). We will tailor you the right mortgage for your purchase. We work for this with an established and certified, more than 100 year old firm near Amsterdam . It all starts with a personal talk. Do local banks offer mortgages for foreigners? Not yet, but the Austrian bank do have branch offices locally, and also in, for example, London . What is the leverage to value for these mortgages? In general maximum 70% is mortgaged. This accounts for newly build, as well as existing, off-plan and new building projects. Do you pay profit tax on the over-value when you sell the property? If you are purchasing the property as an individual (natural person) you are, 3 years after signing the purchase contract, exempt from profit tax over the over-value. If you are purchasing as a company, you always pay 20% profit tax in Croatia at the moment you dispose of the property. Are any taxes levied when selling stock in a company that contains real estate? Transfer of stock is not taxable. However if you sell the stock for more than its value, you are subject to profit tax. If you just sell the stock of the company with the property in the share capital, you are exempt from real estate transfer tax. This advantage is however not applicable whenever the tax authorities could prove the company was founded with the sole purpose of evading this tax. What is in fashion these days? What do people look for? What sells the very best now? Villa's at 285.000 euro and high end full service resorts. Are many foreigners purchasing real estate? It is mostly foreigners who buy real estate in Croatia , and some Croats, mostly from Zagreb . What is the hourly wage of a construction worker? Are building materials manufactured in Croatia ? Raw building material is produced in Croatia and is relatively inexpensive. Finishing material and wood are mostly imported. Croatia as a country imports a lot in all sectors. Prices for finishing material are comparable to western European prices, or even less expensive in the country where they are manufactured. Is the cadastre now completed updated and in order? The cadastre is updated and digitalized (with EU funding) and ranks now as one of the most modern systems. One can online check ownership and burdens.. for most of the regions. 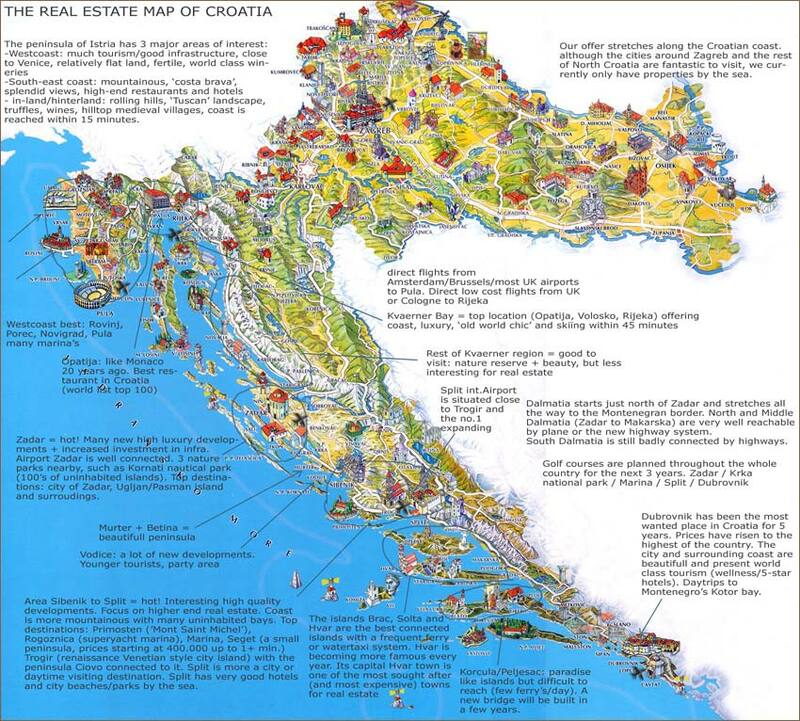 The hinterland of Dalmatia is, for example, not mapped in terms of ownership. Istria is the best organized, as the land registry was set up under Austrian Hungarian rule and has, ever since, been maintained well. Are there urbanistic plans in place for the communities on the mainland? Town after town is publishing its new 'zoning plans'. Its an ongoing process. Zoning plans point out what will be building land and what will be a marina, or a hotel, etc. Zoning plans lead to urbanistic plans. With an urbanistic plan in place one can opt for a location permit (not always necessary anymore), then a building permit and then a usage permit. Are there urbanistic plan in place for the inhabited and the uninhabited island? Is it possible to change the zoning of a land? Depending on the local regulations, one can build out of the building land provided the landplot has a certain size. Larger plots can opt for a change of the zoning. It has to do with the decentralized power of the local communities to issue new building zones. Sometimes a developer can take the initiative and sometimes the community does this by tendering the land. What are the normal construction costs of an apartment or villa per m²? Good quality, high end construction with high level of finishing (properties designed for selling in second home market): in average 700 euro/m² construction costs. Can you give an example of infrastructure costs? Asphalt road: 4 m . wide: 50 euro per meter. Is it easy to get a building permit? Not at all. It requires a lot of paperwork and one needs to frequently visit the administration offices. Can you give an example of land prices for residential building land ? Land prices at the coast with seaview? Depending on location and distance to the sea: between 90 euro/m² (far from the sea but full sea view) and 500 euro/m² (at the sea). Prices for seaside land fluctuates a lot. Land prices for farm land? Land prices on the inhabited islands? Land prices on the uninhabited islands? This is not a good investments as it is not possible to build on these. Does annual real estate tax exist? Yes, but it is very inexpensive compared to many EU countries. This question and answer list was prepared based on advise and statements by various professional parties in Croatia . The list is prepared based on trust in these parties and is intended only to give an insight into the Croatian real estate market and its rules and laws on the moment it is published. No rights can be claimed from this list or the information in it. Middelland holds no responsibility from damage in any way caused by inaccuracy or incompleteness of the information given. Croatia is a country in transition and rules and laws are subject to constant change. All data shown on the site, including text, photographs, illustrations, graphics, names or trade names, logos, product and service trademarks are the property of or licensed by the institutions and are protected by copyright, trademark law and/or another form of intellectual property law.